Clark Insurance is not your average, run of the mill insurance agency. Besides being able to meet important insurance needs for business, personal, life and health insurance, there are two things that give the company an edge above the rest - commitment to community involvement and the integrity among staff. Community involvement is only one important contributing factor that makes Clark Insurance one of Maine’s largest, independently owned agencies a leader in the insurance business. 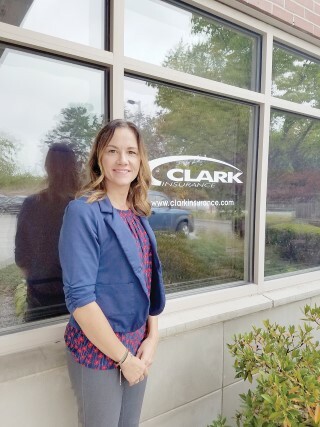 Clark Insurance has been an employee owned company since 1992, a defining characteristic of Clark’s culture of teamwork. Then, in 2016, the officers of the company made the decision to transition into a 100% Employee Owned Company. Presently, Clark Insurance has 110 employees from offices in Portland, Saco, Windham, Gorham as well as Manchester, NH and Lowell, MA. It started out as a small company by Richard Clark in Monument Square in Portland 87 years ago. Darlene Lacadie (pictured here) and Dianne Baggs are available to meet all the insurance needs of Windham, Raymond and other Lakes Region residents. “Clark began as a small business in an office at Monument Square,” began Brissenden. 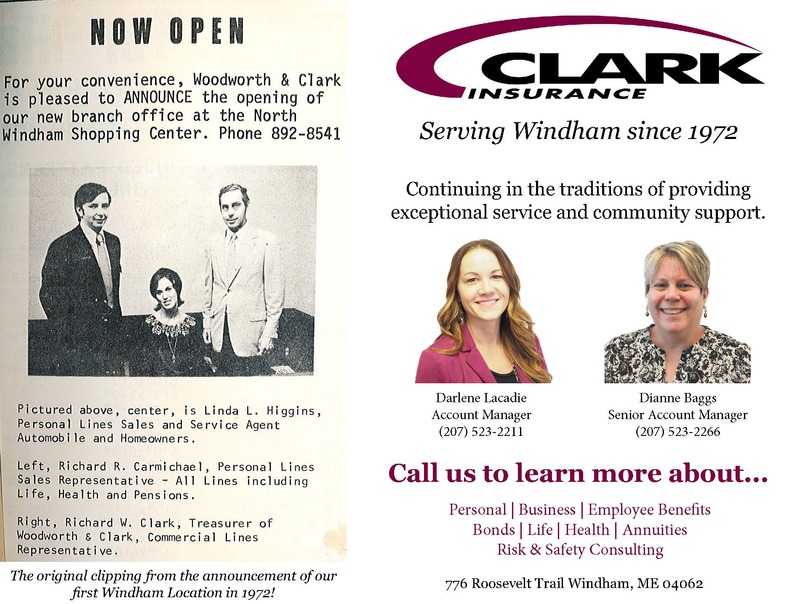 “We kept growing and were required to move a number of times to bigger spaces to accommodate our success and growth.” That continued success and growth is what led Clark to open its doors in Windham in 1972. Presently, the Windham branch is located at 766 Roosevelt Trail with its offices in the Gorham Savings Bank branch. Darlene Lacadie and Dianne Baggs, Sales and Service Account Managers, are available for the insurance needs of the Windham, Raymond and surrounding Lake Region residents. Both Lacadie and Baggs have been providing personal insurance services as well as coordinating business, life, health insurance as well as employee benefits for the past 20 years. You may see them around town as they are actively involved in the Lakes Region community. Lacadie is the President of her BNI-Maine Windham Chapter, a local marketing and referral organization. She has also participated in the Sebago Lakes Region Chamber of Commerce’s Amazing Chase event that raises funds for the Feed the Need campaign and has also contributed $1,000 toward the Windham Food Pantry the past couple of years. Lacadie and Baggs are an example of the many employees/owners that make up the Clark Insurance team. They are committed to their customers and are dedicated to Clark Insurance’s guiding principles of ethical behavior, professionalism, respect, passion, knowledge, experience, and teamwork.